The found-footage trend shows no signs of dying out any time soon, and much of it is tiresome, but director Matty Beckerman has given us a creepy and energetic found-footage thriller with "Alien Abduction," the story of a family of campers hunted down by hostile alien creatures through the woods of Black Mountain, North Carolina. The film has, as its real-life hook, the phenomenon of the "Brown Mountain Lights," which has launched an atmosphere of speculation and conspiracy theories, straight from the Paranormal Playbook. "Everybody up here knows something weird's going on," says Sean (Jeff Bowser), a backwoods guy in "Alien Abduction" who lives in an unheated shack in the Brown Mountain woods. Lights are seen moving in strange geometric patterns above the mountains. There are multiple mysterious disappearances every year. It is thought that the lights are somehow connected to the disappearances. "Alien Abduction" opens like a documentary, showing interviews with physicists and paranormal researchers, who all say that the Brown Mountain Lights cannot be explained, and the situation surely warrants more research. The footage of the film is said to be "leaked" from the U.S. Air Force, whose creation of Project Blue Book in 1952 helped form the paranoid atmosphere on Brown Mountain. Project Blue Book was set up to analyze UFO data and ascertain whether or not UFOs (if they existed) posed any threat to national security. The problem with a lot of found-footage films is the amount of disbelief one needs to suspend in order to accept that people would keep filming through hair-raising moments of terror. Put the camera down and run for your lives! 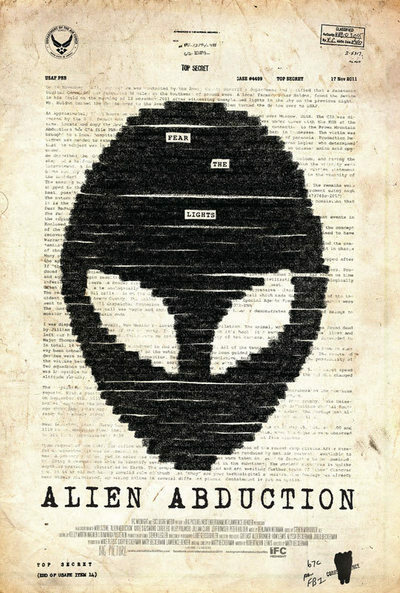 In "Alien Abduction," the camera is in the hands of Riley Morris (Riley Polanski), an 11-year-old autistic boy, who films everything in his life because it helps him engage with the world. The device is a bit too neat, not to mention reductive, but it works. The Morris family, parents and three kids, are on a family camping trip. The mood in the car is jovial. On their first night camping, the three kids look up and see strange lights moving in the night sky. The lights move in tandem in a triangular formation, before jutting off at right angles. Those are no stars. Things get distinctly creepier the following day, and the panicked family find refuge in the cabin of Sean, the backwoods guy. At first it seems that Sean may have strolled right out of "Deliverance," showing resentment about the city folk who come up here to his mountain, but he becomes an important and even heroic figure. The eldest son, a teenager named Corey (Corey Eid), has a small character arc that gives us an emotional pay-off. "Alien Abduction" even takes the time to give us a quiet and beautiful shot of Sean and Corey sitting on the front porch of the shack, waiting, staring out into the green forest, rifles cocked and ready. The alien encroachment is suggested by swooping white high-beams appearing in the windows, the blinding light seeping through the cracks in the walls, pouring down through the floorboards. It's old-fashioned terror, and less is definitely more. There is one long shot of a country road covered in dead crows that is hair-raising in its eerie and awful simplicity. Beckerman intersperses the footage with static, loud and jagged, and the couple of "effects" included are quick and dirty. If you're going to go the found-footage route, you might as well try to find a new way to approach the material. Beckerman has.